"M3" redirects here. For the weapon, see WW2 M3 submachine. 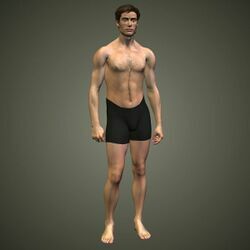 Michael 3 (or M3 for short) is the flagship human male character in DAZ3D's "Generation 3" figure selection. He is not a free character; one can purchase a copy of the figure from DAZ3D. This page was last edited on 24 September 2018, at 17:44.